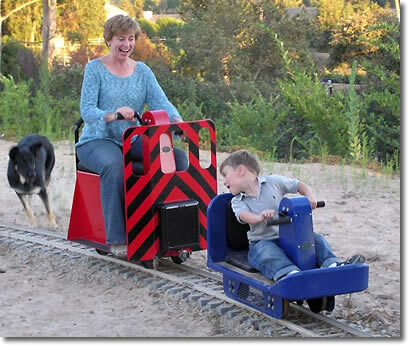 Hand Cranked Railroad Speeder Car - Roll Models Inc.: Miniature train and railroad equipment for your club, backyard, or park. RMI's Hand Crank Speeder is sure to be a solid workout for any age passenger. A rugged gear drive ensures long-lasting fun. Ideal for backyard tracks, temporary layouts or branchline travel. Perfect for kids from three to ninety-three!